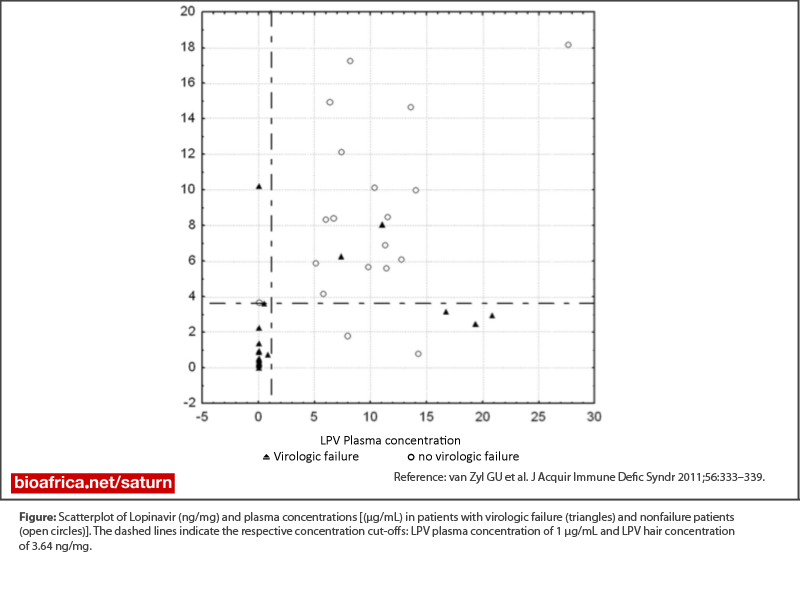 South African patients receiving a regimen of LPV/r, didanosine and zidovudine as a second regimen have a high prevalence of virological failure (30-40%). This could be due the poor tolerability of the regimen. However problems with adherence are often not disclosed. Therefore objective measures of drug exposure such as plasma concentration (recent drug use) or hair concentration (longer term drug use) could be helpful in identifying those patients with failure despite good adherence who would need resistance testing. In a study of patients failing this second-line regimen in 2009 conducted in two public healthcare sites, only 2 of 93 patients on this regimen had protease inhibitor resistance. A high lopinavir plasma or hair concentration had a negative predictive value of 86% and 89%, for virological failure and the use of both plasma and hair concentrations could detect all patients with inadequate drug exposure and who did not have resistance while having virological failure of the regimen. We therefore propose that lopinavir hair and or plasma measurement should form part of the work-up of patients failing a second-line boosted protease inhibitor regimen to exclude patients with inadequate adherence from genotypic antiretroviral resistance testing.